This past weekend saw heavy rains in the North Shore region of Massachusetts, resulting in major flooding on roads that trapped cars. Not this one person, though, who was filmed driving their Porsche 944 through the high waters in Lynn, MA, by NBC Boston reporter Glenn Marshall. You can see the Porsche, er, powering through the water and coming to a halt after passing a minivan. It’s not clear how the car is pulling intake air. But it’s safe to say that you should never drive in a flood. 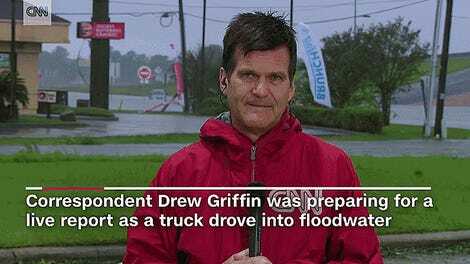 It’s actually one of the most dangerous things you can do during a flood. This is because, as Vox outlines, as drivers drive on flooded roads, they can hit pools and spin off the road, stall and get stuck as water levels rise, get carried off by moving water, hit toppled trees or unknowingly drive into collapsed sections of road. Sometimes, you simply cannot tell how high the water is. The National Weather Service Boston warned people not to drive through flood waters. I hope this Porsche driver got to some dry ground and then promptly stopped driving.